We've all eaten our fair share of pizza, but how many of us have actually stuck our hands in the dough and made it ourselves? Probably not many, but that's about to change, because in Good Pizza, Great Pizza, you'll be making the pizzas yourself, from scratch and completely by hand. Hungry customers are lining up at the door, every single one of them has a different idea on what constitutes the greatest pizza imaginable, and it's your job to satisfy them all. Can you do it? Probably not, but the oven's on, so you might as well give it a shot! - Handcraft every component of every pizza you make! Spread the sauce, sprinkle the cheese, distribute the toppings, and slice them in whatever way you like. - Fulfill an endless combination of orders. Make plain pizzas, white pizzas, pizzas with everything, pizzas with nothing, half-pizzas and more! - Add sauce, cheese, pepperoni, mushrooms, sausage, olives and more to your pizzas. - Work fast! The faster the customer gets the pizza, the bigger your tip will be. - Upgrade your pizzeria. Add tables and chairs, spruce the place up with decorations, and expand your menu. 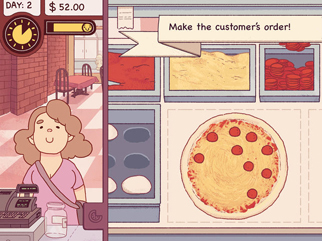 Good Pizza, Great Pizza takes the tried-and-true business simulator, and flips it on its head. Your success will not only be determined by how you manage your finances, but also in how good you are in preparing your customers' food. If that sounds like the thing you can sink your teeth into, then come on in to Good Pizza, Great Pizza. We guarantee you'll have a good time and a great time! What Does it Take to Make a Pizza? We all know what pizza is, we all know what makes a good pizza, and we all get annoyed when the pizza we get deviates from that perfect ideal form in any way. However, we never think much about how it feels to be the guy who has to make the pizza. Pizza may not be the hardest dish to prepare, but with so many ways to make it and so many different opinions on how it should be made, it can be a surprisingly hectic experience for the uninitiated. That's the impression that Good Pizza, Great Pizza leaves anyway. The good news is the pizza-making is also really fun, or at least it is in this app. The object of this game is to make pizza. 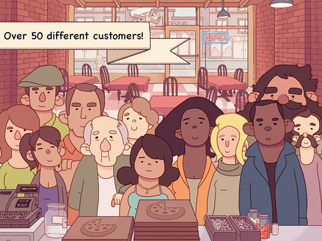 It sounds simple enough, but the developers of Good Pizza, Great Pizza put in a lot of work to make the process as detailed as possible. Everything involved with making a pizza is likewise involved in this app; you flatten the dough, apply the sauce, spread the cheese, add the toppings, cook in the oven, slice into wedges, put it in the box, and you don't ever click a single menu the entire time. The pizza-making process in this app is done via intuitive drag-and-drop controls, and it works remarkably well. It feels a lot more real, and it in a sense contributes to the game's challenge, but we'll get to that later. As a business owner, you can't just make any pizza you like; you have to make what your customers want. Everyone has a favorite topping, for one thing. Some may just want cheese, some may want pepperoni, and others may want mushrooms, sausages and olives all at once. However, things can get more complicated than that. Sometimes, people will want separate toppings on two different halves of the same pie. Some people may ask you to omit the sauce or even cheese entirely, and others might request that you blacken the crust. The combinations can get weird, but as the resident chef, it's your job to stay on top of it all and fulfill their requests no matter what. As a result of all this detail, the gameplay loop feels messy, but in all the right ways. You're fighting against a lot of things in this app: all the steps you have to remember, all the steps you have to occasionally un-remember, and your own imprecise fingers. Putting cheese, sauce and pepperoni on a pizza is easy enough, but trying to put on just the right amount of each within the proper bounds and distributing them evenly is as tricky here as it is in real life. On top of all that, time is of the essence. You only have so many hours in the day to service your customers, and cooking faster gets you bigger tips. Maximizing your profits is all about finding the right balance between speed and precision, and that can make Good Pizza, Great Pizza pretty tense despite its mundane subject matter. That aside, the app in no way looks tense. On the contrary, it looks more relaxing than anything. 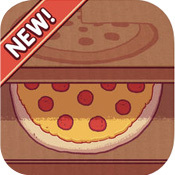 The artists over at TapBlaze saw fit to set Good Pizza, Great Pizza in a whimsical cartoon world that looks very much like a children's book, and the effect works very well. Everything's just so friendly, save perhaps the dastardly-looking competitor from across the street who occasionally comes in to mock you. They all speak in a nonsensical gibberish language similar to The Sims, and all the action is accompanied by a simple homey and vaguely Italian tune. It makes for a very charming package. More than that, the app is funny. You meet all sorts of odd characters during business hours, whom often have funny things to say and even funnier ways to order their meals that don't always make their intentions clear. While this sounds like it could get frustrating, just trying to sort through their nonsense is part of the fun, and anyone who's ever worked in food service will tell you it's not unlike anything they've had to put up with. You're also treated to occasional broadcasts of the Pizza News Network. Pizza is apparently a huge deal in this town, and these scenes show just how deep the obsession with pizza goes. TapBlaze was having a lot of fun making this app and it shows. Conclusion: Good Game, Great Game! If there is anything negative to say about Good Pizza, Great Pizza, it's that it can get repetitive after a while. Customers have an impressive number of things to say when they order and receive their food, but not enough that you won't hear some repetition after a while, and it gets tiresome. The constant smearing of sauce and cheese does as well, both mentally and for your poor finger. If you want to prolong your enjoyment of this app, keep your play sessions short. Besides those issues, it's a great all-round product. The gameplay is engaging, the presentation is top-notch, and the app never attempts to give you the hard sell. You can watch an ad to get a bigger tip every in-game day, or spend real money for in-game money needed to stay afloat, but these are optional, unneeded if you play skillfully, and never in-your-face. By all means, treat yourself to some Good Pizza, Great Pizza, and when you're done, order some of the real stuff because you'll definitely get an appetite for it!